I’ve had raspberries growing in my garden for the last 22 year. The raspberries came my way via my maternal grandmother’s garden. She planted hers in the 1920’s or 30’s. The variety she grew are Heritage. A friend who runs a public garden at a historic site in my area says, mine might be a heirloom variety, grown before more contemporary changes were made to the plant. Before moving here, I also had a small planting of grandma’s raspberries at my first house, and my mother still has grandma’s plants at hers. Planting Raspberries..Spacing Rows When I bought Whimsey Hill House 22 years ago, one of the ideas I had for the land was to have rows of raspberry bushes. A few days before moving in (the house had been closed down and vacant for 2 1/2 years) I was lucky enough to be able to dig up some mature raspberry bushes from my old house and move them here. I just planted them anywhere that September. I just wanted to get them into the ground, so I would have some to start the new garden with the following Spring. Over the Winter (1990-1991) I read a number of articles about planting raspberries. Back then mostly all the articles said Plant raspberry bushed 3 feet apart, in rows spaced 7 feet apart, so that is what I did. Over the years I’ve come to the conclusion the information was Partially Wrong. Those people (garden writers) never planted raspberry bushes themselves. Their row spacing information was off. I feel when planting raspberries, plant each bush 3 feet apart, but space rows 10 feet apart. Raspberries as they grow will get tall and start to bend over (arch). The canes will start to grow across the paths, and block your way up and down the aisles, making picking harder. Ten feet between rows will allow for easy maneuvering around the bushes. I will say here, I let my raspberries grow naturally, not tying each cane to support wires, that stretch up and down the rows, that are attached to end of aisle supports. If I did it that way, and that would be a lot of extra effort for me, the 7 feet of space between rows would probably be OK. Preparing the Site for Planting ..Plant raspberries in a place where they will get full sun to partial shade. Full sun is 6 plus hours of direct sunlight each day. Also make sure they are sited in a place where the soil drains easily after watering or when it rains. Before planting your berries amend (improve) the soil. I have a gravely-sandy kind of dirt here at Whimsey Hill. Before planting anything, I work a good amount of sphagnum peat moss and some dehydrated cow manure into the soil. I try to mix the amending product down a good foot, so the soil is not just topically corrected. When I planted the rows of raspberries, I used a combination of older plants, brought from my first house, and suckers from my Mother’s garden. Suckers are new raspberry plants that emerge from the ground each Spring. They can easily be dug up and replanted. The older plants, as well as the new suckers lived. The older plants, having more developed root systems, produced fruit that year, where as, the new Spring suckers took an extra year or two to grow and become established, before producing an abundance of fruit. 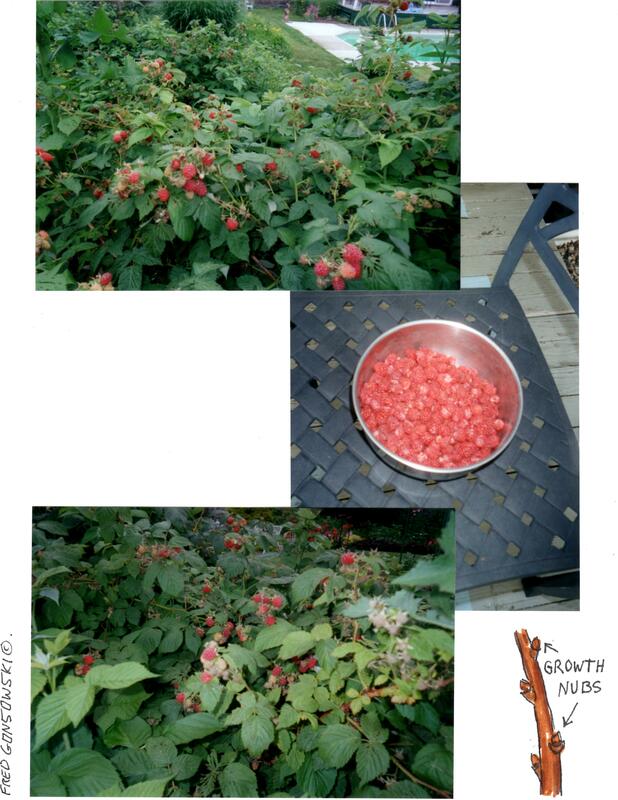 After planting the raspberries, that year, I put mulch on the ground around the plants. Raspberries really don’t need to be fertilized to produce well. If you do fertilize, use an all purpose granular product like Espoma Plant-Tone, in early Spring, or sprinkle some dehydrated cow manure around the plants, when growth starts to occur. Lifespan of Heritage Raspberries ..The Heritage Raspberry, in my part of upstate New York USA, zone 5-4, produces fruit twice each year, first in July then in late September until the middle of October. A new Spring sucker will only produce fruit in late September through October. That cane will lose its leaves in Fall, but live through the Winter, to then leaf out in Spring and produce fruit, one more time the next July. That fruit producing cane will live through the rest of Summer, but then will die. Neatening up Your Raspberry Patch, Cutting out Dead Canes ..The best time to neaten up the raspberry patch is in late Winter to very early Spring (February through March). At that time you will see one half of all your raspberry canes have died. Those canes, the dead ones, were the ones that produced fruit last July. What you want to do then is, with a good pair of loppers, cut the dead canes off, close to the ground as possible. The dead canes are the dried up looking / light gray-beige (driftwood) colored ones, that have no new growth nubs on them. After that you want to shorten the length of the canes that are alive. They will be a rusty-brown color, looking like the cane in the illustration. I like to cut them back, so they stand 40 to 42 inches tall. For me, that is waist high, equal to the buckle on my belt. Running up the sides of each raspberry cane are nubs (look at the illustration). From those nubs, Spring growth, and eventually fruit will develop. When trimming the top of the canes, cut just above any one of the nubs. After cutting out the dead canes, and shortening alive ones, I also encourage you to go through the patch again, and cut out any canes that are thin and pencil like. Also eliminate alive canes here and there to keep rows looking straight. If for any reason, you can’t cut back canes when they are still dormant, and they start to, or have leafed out, just cut off the dead tops, and try to do the work earlier next year. You will notice the year without proper trimming, raspberry canes will be much bigger, rows will not be straight, and picking from that tangled mess will be harder to do. I have noticed that weather conditions affect raspberry production terribly. If there is too much rain before the fruit is ready to pick, the fruit will mold. Extreme weather changes, from hot to wet to hot again, will also effect the fruit. Sometimes, berries that are fine today, tomorrow will not be edible. Sometimes parts of berries dry up before the fruit has fully ripened. And to top off all the just mentioned berry issues, I have to carefully look into each berry to make sure there is not a little green worm in it. Some people jokingly call the worm an extra bit of protein. I’d rather get mine from eating an egg. Once at a farmer’s market, I asked why raspberries are soo expensive? The farmer told me their shelf life is really short. So there you have it, Raspberry Cultivation 101. Even with all the work it takes to clean up the patch, fruit production effected by the weather, and those darn green worms, it is an enjoyable event, when you pick berries for later use, or just graze through the patch picking and eating until your stomach is full, or your heart is content. Now go out there and plant some Raspberries! This entry was posted in Plant Tomatoes / Raspberries, The Autumn(Fall) Garden, The Spring Garden, The Summer Garden, The Winter Garden. Bookmark the permalink. Here is another great article on how to grow your own raspberries. Jen thanks for your comment, and I will look at the article you posted. Enjoy your raspberry plants, mine are almost ready to pick. Because they are everbearing Heritage raspberries grow berries on first year canes so they can be cut down to the ground in the spring to make way for a heavier Fall crop from August-October or until it freezes. I opt to do that. Its easy maintenance, always brings a heavier berry crop, and a longer berry season.